Panasonic plans to make the 2010 Vancouver Winter Games the first "HD Olympic Winter Games" with all the Olympic videos to be delivered completely in HD. Panasonic is providing a full lineup of High-Definition (HD) equipment to support the broadcast of the Olympic Games; delivering the largest supply of AV equipment for any Winter Games in the company's history. 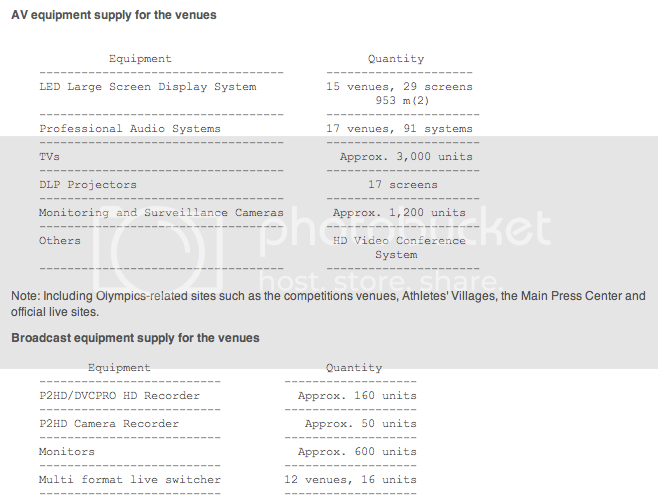 Through cooperation with the International Olympic Committee (IOC), the Vancouver Organizing Committee for the 2010 Olympic and Paralympic Winter Games (VANOC) and Olympic Broadcasting Services Vancouver (OBSV), Panasonic will supply its HD video equipment to the competition venues and broadcasting locations. Panasonic will supply a full array of sound systems, plasma display panels, AV systems and broadcast equipment. In addition, Panasonic plans to support a secure Olympic operation by providing high-quality picture and high-sensitivity surveillance camera systems for the indoor and outdoor Olympic facilities, the surrounding areas and highways. Panasonic's Olympic TOP sponsorship runs through the 2016 Games in Rio de Janeiro.